JUPITER, Fla. (AP) The Miami Marlins‘ offseason fire sale didn’t include their most expensive pitcher, probably because there’s little market for an injury-plagued $18 million left-hander. 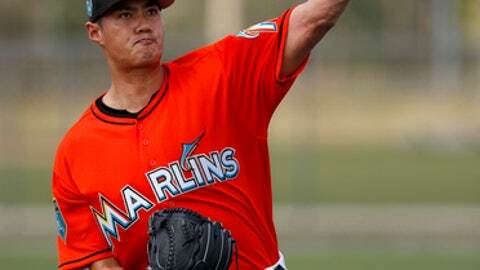 So Wei-Yin Chen remains with the Marlins, a luxury they can’t really afford. He began a throwing program in mid-January to rehabilitate his balky elbow, but is not expected to be ready for opening day. The Marlins hope he’ll join their thin rotation at some point this season. Chen was hailed for his durability when he signed an $80 million, five-year free agent contract with Miami in 2016. He averaged 177 innings per year from 2012 to 2015 with Baltimore while going 46-32. But he’s 7-6 in two years with the Marlins, with only five starts last season. He was sidelined from May 1 to Sept. 4, and allowed one run in six innings in four late-season relief stints. Chen has been pitching with a partially torn ulnar collateral ligament, but Tommy John surgery was ruled out last fall. He instead received at least one platelet-rich plasma injection, and has undergone other therapy as well. In the past month Chen has been gradually increasing his throwing distance, and he expects to start throwing bullpen sessions in early March. The Marlins are desperate for pitching , with only two starting spots settled, and more than a dozen unproven candidates for the three other jobs. And they’d love to get more return on their Chen investment. The $18 million he’ll receive this year makes him the Marlins’ highest-paid player, and they owe him $20 million in 2019 and $22 million in 2020. Those numbers are especially eye-popping for a team that traded away its entire outfield this winter after CEO Derek Jeter deemed the roster he inherited unaffordable. Chen’s big contract has likely compounded his frustration while dealing with elbow issues the past two seasons, Mattingly said. ”I think you always feel like you’re in a sense letting people down,” Mattingly said. ”He was a big signing for us. You go out on a limb. You don’t want to have bad contracts here, because they really hamstring you. I’m sure he feels bad. Chen said he’s optimistic he can still pitch effectively. He just doesn’t know when his season will start.